At Ekta Kapoor’s Diwali party on Tuesday evening, Alia did desi in a mint colored brocade Raw Mango sharara (or is that a lehenga?). 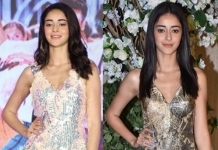 Opting for kohl-rimmed eyes, her look was finished out with metallic sandals, silver earrings and a cream and gold potli. She looked sweet and it’s an outfit we’d wear in an instant! Alia’s dressing is opposite to Sridevi, Shilpa, Aishwarya, Sonam, Deepika and many other senior ladies. She doesn’t go OTT, wears minimal jewelry and makeup. This color looks pleasant and brocade looks understated, not gaudy. 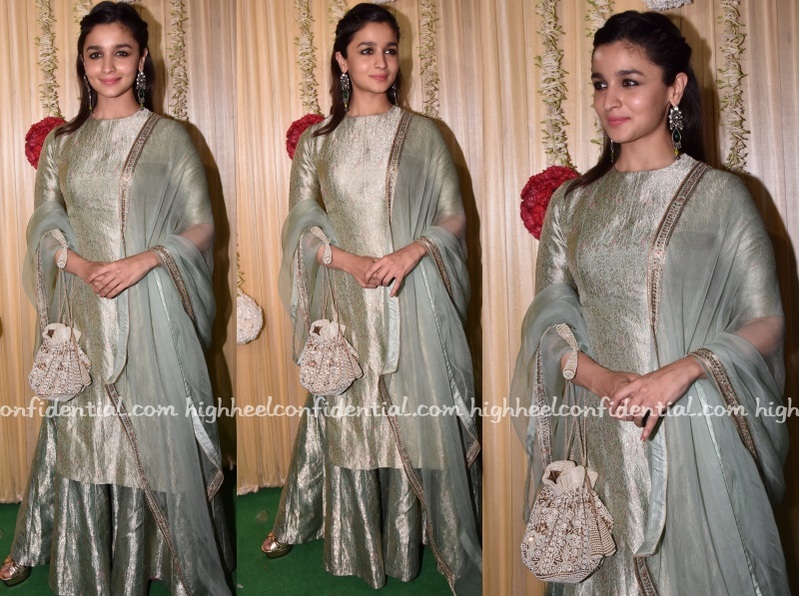 I am not a fan of Alia or her dressing, but her dressing is much better than many senior ladies mentioned above. Cautious clause inbetween the comment (I am not a fan) since the hate comments left in Alia’s posts by you are countless. Well played. Now I say, she knows how to dress smart and apt. Right now her dressing is better than many. She is definitely going to shine. If she continues this way she will definitely going to bring change. If others dress smart they too will shine, simple. I am not a fan of anyone on this blog, obviously, because Bollywood is a discoball. At least someone is wearing something understated and nice. Love! Alia looks absolutely gorgeous. She might not be the trendiest or the most fashionable but she is by far the most sensibly dressed girl around. Film promotions, movie screenings, festivals, parties- she is never over the top or garish. Yes, that is undoubtedly true. She is looking very sweet and elegant. This girl could easily play young Asha Parekh. On Raw Mango’s site all their collection looks so so covetable but I was a little underwhelmed when I actually saw a capsule collection. Good craftsmanship but lacks character. I hate her eye makeup but I love her outfit! The colue suits her very well. She is the cute button of Hindi cinema. Never lose that charm and give in to the bling brigade. Even I wish she doesn’t fall into the trap of bling brigade, try hard and wannabe. She should maintain this level of decent dressing. She looks beautiful. Always so elegant, minimalist looks, no OTT be it western or desi. She is one of the best in Bollywood. Wish to see her in Tamil movies. We could use such young, fresh and non OTT girls. She’s the fresh pretty young face who stands her own in the pool of try hards, ott’s, wanna be, trend stalker’s.. love her choices. Always so good n fresh n never so bad to dislike much.